At each monthly meeting, we present an educational program designed to meet or exceed member expectations. 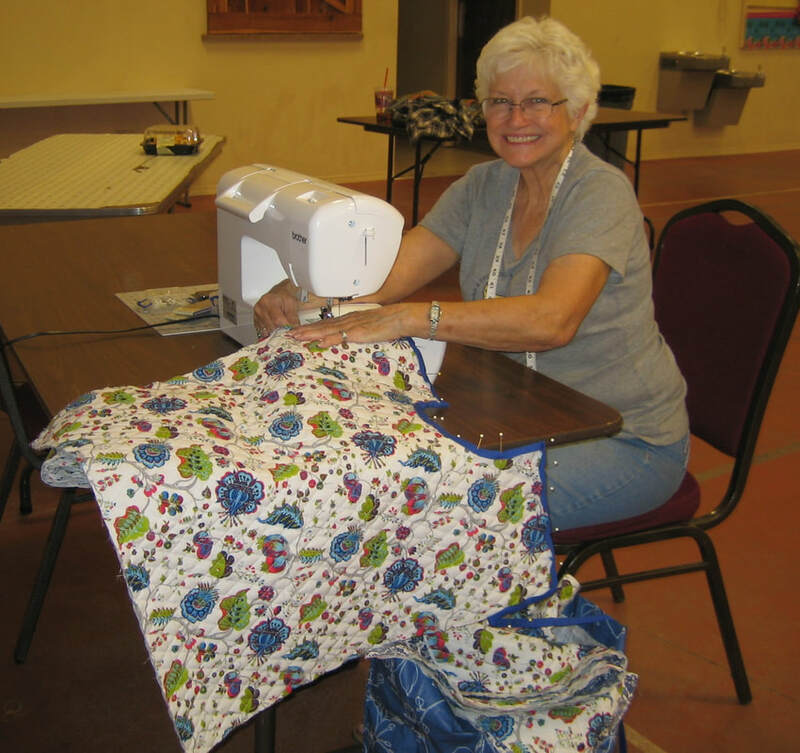 Our programs cover a variety of quilting topics suitable for diverse skill levels. All emphasize learning and creativity. Some are lectures, often with a slide show or hands-on demonstration, while others include a workshop. Our visiting and member speakers are the backbone of our programs. Experienced quilters with skills and knowledge ranging across quilting subject areas, generously share valuable information and offer ongoing assistance with our projects. All of our programs are designed to inspire and educate members while encouraging friendship and enjoyment among members. 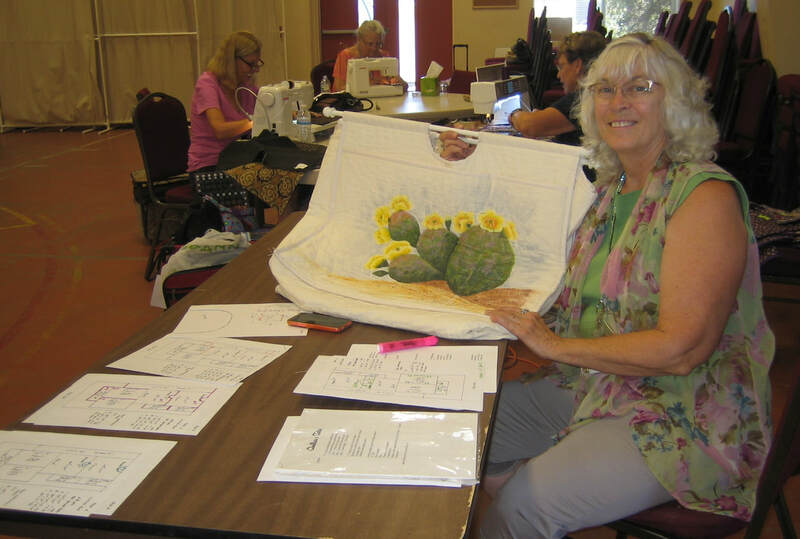 ​Lucille Hurley will be be presenting a Tote Bag class that will be the Program portion of our regular meeting in September. The regular meeting will run as usual and the Program portion will be last. If you are not taking the class, feel free to leave. There are still class openings so you can still contact Lucille if you would like to join this fun class. If you are signed up for the class, have all your pattern cut and be prepared to have a great time making such a wonderful bag. ~ There were seven us attending the workshop. What a great relaxing time we had! It always nice to get to know other and newer members better. Marci took orders from us for Pizza Hut and she went and picked it all up so we could continue to cut and sew. We all left in various stages of completion of the tote. Lucille graciously said she will be available to anyone that gets stuck before they are able to finish. We all left with a complete set of instructions. Patsy specifically referred to the long arm machine recently donated to the Chino Valley Quilters Guild. Normally our Installation of Officers would be in April, however, too many of the important members would not be available in April. As I said on the front page, the Stitch'n Sisters were busy decorating the hall and setting up all of the food and accompaniments ready for each of the many tables. The hall look beautifully Spring-like with an array of delicacies all set! Members arrived and marveled at how lovely their tea party looked and smelled. The installation was the big event of the day with the new officers' acceptance of their positions; Lucille, Charlene, Pam, Mary Pat and Marci were sworn in by Sandi. Then Marci Meyer was thanked for her two years of service and fun. Lucille Hurley (as Marci's Co-Chairperson) presented Marci with several thank you gifts including one special gift that Lucille made especially for Marci. Games were played and beautiful prizes were awarded. Everyone had a delicious morning tea. A big Thank You goes out to the Stitch'n Sisters for all of their great decorating and food! See the picture gallery including the parade of hats here. . . This was a Sew-In meeting and, therefore, no show and tell. 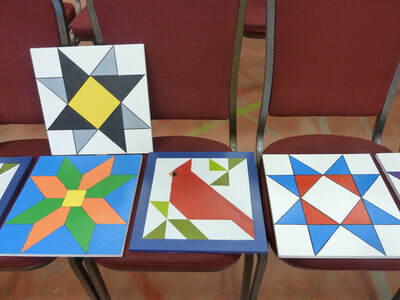 However, we did display the finished Barn Quilts made by our members. A big thank you to Charlie for taking time from his very busy schedule to visit with us and present techniques for maintaining various types of machines. The maintenance he demonstrated should be regularly used and is not a replacement for your regular annual maintenance and repair. Using caution and having the right tools is very important when cleaning your machine. Charlie feels it is so important to clean the dog feeds and also remove the plate and remove lint and dust. Lightly oil the needle shaft and only oil under the needle areas if you machine owners manual directs it to be done. Pat said she would handle the Christmas party and handle it she did! Her brightly designed invitations for our December 12 Brunch went out to each member in November. Members were asked to bring a quilt related gift valued between 10-15 dollars. The beautifully wrapped gifts became centerpieces at each table. Patsy set the menu and passed a sheet for members to sign up and bring a dish. The brunch, as always, was delicious with so much and such a variety of dishes! After Brunch, Patsy read a Christmas story and we played the "left, right, left" game. As she read the store, the centerpiece gifts were passed left, then right, etc. At the end of the store we got to keep the gift at the last pass. We also played a Christmas Bingo game and prizes were given to the winners of each game. A delicious and fun time was had by all and we give a big THANK YOU PATSY! To see photos from the Brunch, click here. 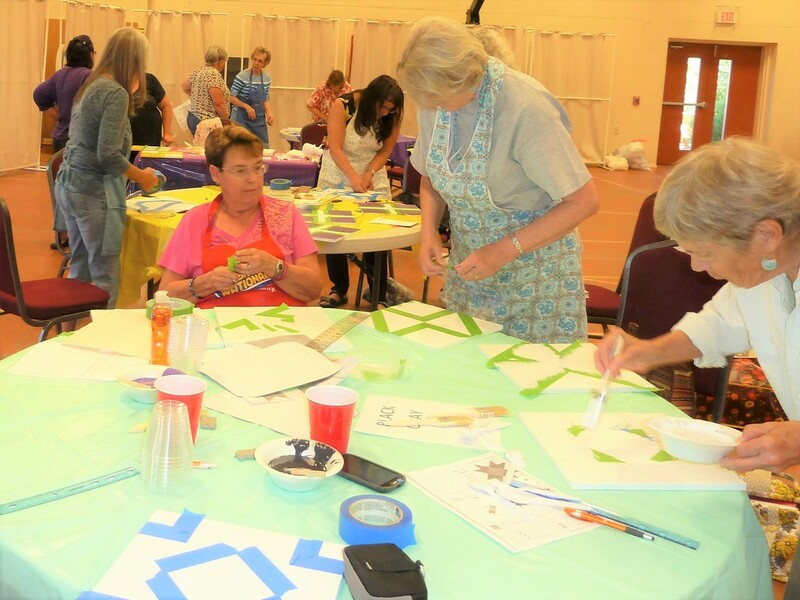 . .
After recently having two of her quilts appraised by a certified AQS appraiser, Judy (active CVQ member) feels she learned a lot of information to share with members. Allow about an hour for your appointment with a certified quilt appraiser and bring along quilt information, who pieced, quilted, designer, special materials, cost/quality of materials and embellishments. Bring the quilt! Has the quilt earned ribbons, prizes or been a featured display in shows? Did you add any special techniques to the original design, i.e. a flange, etc or change the pattern in any way, layout, borders, unique binding or borders? If so, the quilt could be considered an "original" design. Deviations of any kind add value. Make sure to have a label or two or three. Very Important. The labels must give credit where appropriate and tell a story of the quilt. Remember...it's just a blankiet unles you have it appraised. See more helpful information HERE. . .
and also HERE. . .
Liz Hart reminds members that the October meeting will be a Sew-In and they will need to bring machines supplies. Quilt kits will be pre-cut and ready to sew! Batting and backing material will be available as well as an ironing station. Remember that since we donated 25 quilts to the Texas relief, we now must make up for those 25 quilts. Welcome to the sew-in and have a wonderful and fun time! ​​Patsy is a long time quilter and long arm quilter. She will explain everything she knows about choosing the correct batting for each type of job. Batting comes in so many different fibers such as cotton or polyester, but there is also wool, silk, bamboo or a poly-cotton blend. Don't forget about size, loft, brand, what is best for your machine, and etc. 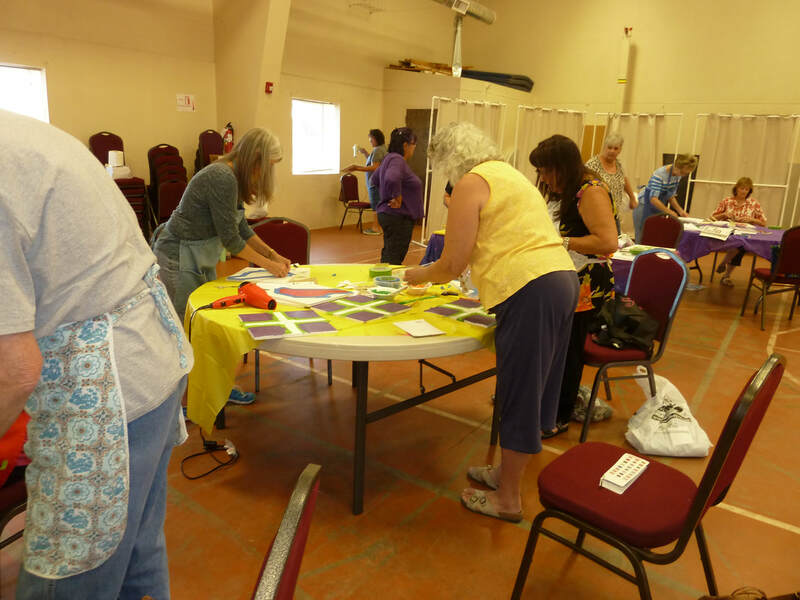 Members had a great time at the Barn Quilt workshop at our August meeting. So much fun to pick a 12" x 12" quilt block pattern and transfer it to a 12" x 12" square of wood. Each member will paint two blocks. Now the fun part, painting the design. We thought taping around the design would be easy, but it took quite a while. Each time you painted one color and then dried it with a hairdryer, you needed to tape for the next color! Once the barn quilt blocks have been completed, members will proudly show them off at the September meeting. 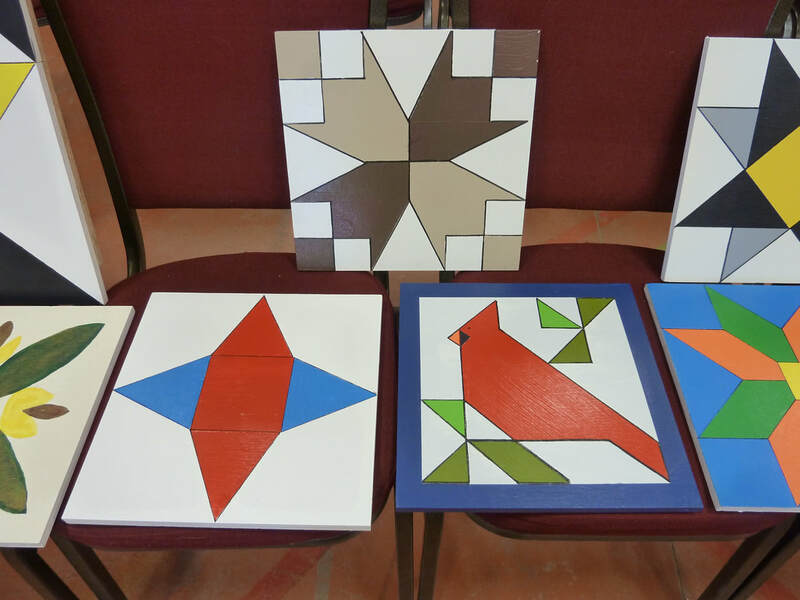 Note: Members signed up and paid a supply fee to participate in painting their own wooden 12" x 12" barn quilt. Marci Meyer (Chairperson) along with her husband, Tony, will gather supplies and cut the wood in advance. Members are to come ready to paint and have fun with a copy of their favorite quilt block. When completed these block will be a beautiful accent for a front/back porch, over the garage, or along a small yard fence; anywhere you want to welcome all! We also encourage participants to just go ahead and make two of these 12"x 12" blocks; the extra one to be sold at our Quilt Show 2018 Marketplace. Generally, the barn quilts are much larger depending on building size; 8 ft x 8 ft, 4 ft x 4 ft or 2 ft x 2 ft.
To learn more about barn quilts and their history enter here. . .
And see more examples here. . .
Liz talks about changes in the Comfort Quilt project while members bring their machines and supplies (fabrics furnished by Liz and her committee members. Watch and listen as Donna explains the fun of creating your own cards, stationery, and more. More and more people are enjoying the art of creating their own cards and stationery. You will see that making a lovely custom card for someone special is very fulfilling. Plus, your someone special will know that it was created just for her/him! Have you received a Save the Date or Wedding Invitation lately that was home-made? Some of them are gorgeous and must have taken hours of work to create! There are so many ways to use this art being shared by Donna. ​See archived programs for more. A beautiful meeting is planned! Tables will be decorated, spring dress with hats if members want to do so, lots and lots of great food provided by members. Of course, games and prizes. And, remember we are having a Brown Bag Auction. ​You do not want to miss this meeting. Read more here. . . The March program was very informative and geared for beginners to advanced quilters. It was presented by three of our members. 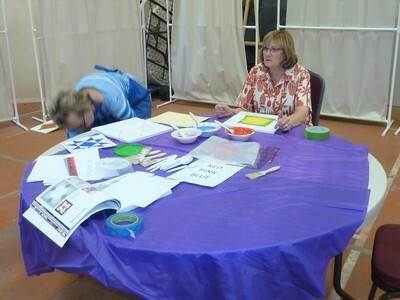 Sandy White showed us how to piece and work with Fleece as backings for our quilts. She even explained a unique technique to sew the seam and flatten it at the same time. This brought up a discussion on an edge joining foot that many of our ladies had never heard of. Specialty feet will be a program in the near future. Sandy then passed samples around so all could see how the technique worked. She also sent around samples using the same technique and decorative stitches. ​Mary Pat Lujan explained how to piece leftover batting together to make workable yardage. Mary Pat showed examples of straight edge as well as a long serpentine edge and many of the ladies interest in using this technique. Pat Smeaton closed the program with "Pieced Backings". 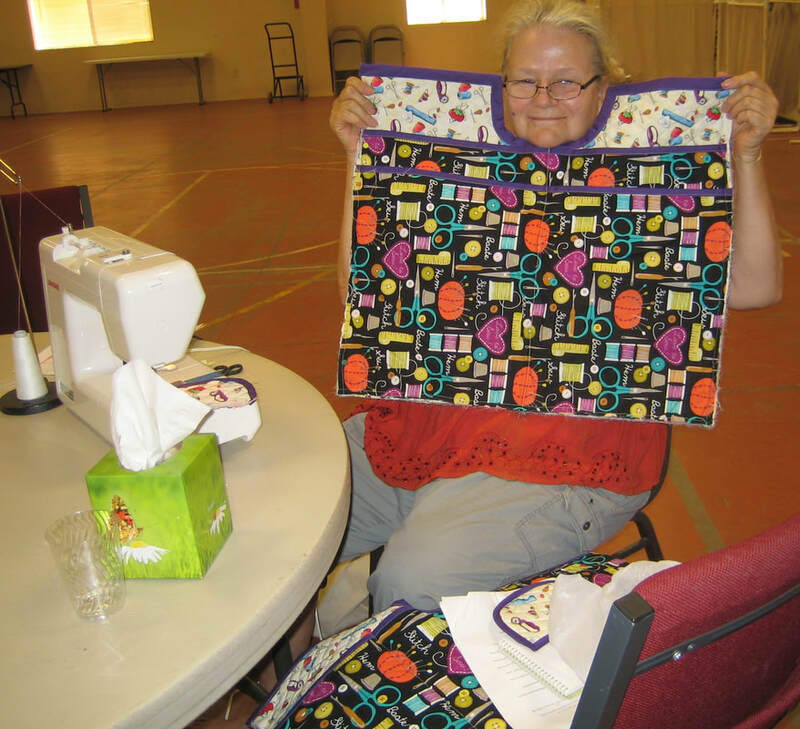 She explained the method of piecing both whole cloth as well as scrap fabrics together to create yardage large enough to create the baking for a quilt top. She displayed many examples that were works of art in their own right. Thank you ladies for a wonderful and informative program. ​There will be no regular October Program. Members will be busy finishing up last minute lists or items for the Quilt show. We have all worked very hard to create an outstanding display. ​We hope everyone attending our show has a fun and inspiring time. Lucille brought all things needed to make the beautiful little felt ornaments for the Chino Valley Quilters Guild Christmas tree! She went through the instructions step by step and said that all of the ornaments have the same basics. She invited members to take anything they might need to make a few ornaments for our tree. ​​Carol Miller presented a trunk/slide show entitled “My Travel Quilts” a compilation of original designs inspired by her various travels throughout the world. ​Members will be bringing sewing machines and necessary supplies to sew more beautiful comfort quilts. Carol and group will provide all fabrics, binding, and backing materials. All of our members will bring "potluck" dishes to pass for lunch. Members have been asked to bring several sewing essentials to our June meeting. This meeting will be a Boutique Sew-In. Although our "Boutique Bin" continues to fill up with beautiful and new items, we are always looking for more. There will be jobs for everyone; cutting, sewing, gluing, ironing or whatever. The point is to just come and have some fun while you contribute your talents! A reminder notice will be sent out prior to the meeting with more details and requests. Have you ever looked at your stash and thought "What the heck? Why do I have all of these fabrics with nothing to go with them? Or maybe you bought a beautiful fabric you fell in love with because of it's unusual color but then you can't find anything to match it. 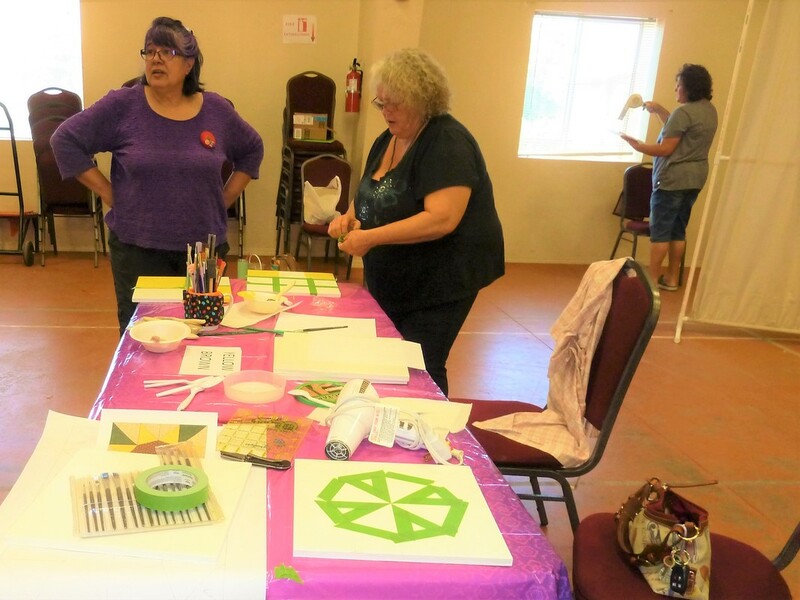 ﻿~ hosted by the Quiltin' Sisters friendship group. The decorations were beautiful and fit the theme of 'As The Spool Turns"​' perfectly. Honey, I Shrunk the Quilt! 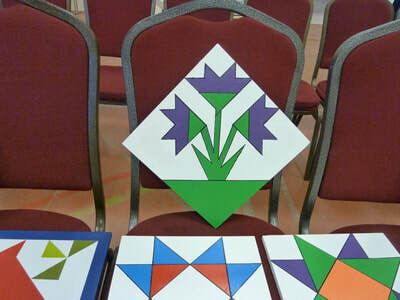 Genny asked members to join in making a quilt and then reducing it in half. Does not matter what pattern or what size as long as the next quilt or even a third quilt is reduced 50%! presented by Sew Fine Quilters friendship group.
. . . These can be buttons, jewels, beads, bling of any type and of course some type of ribbon or cording for the hanger. 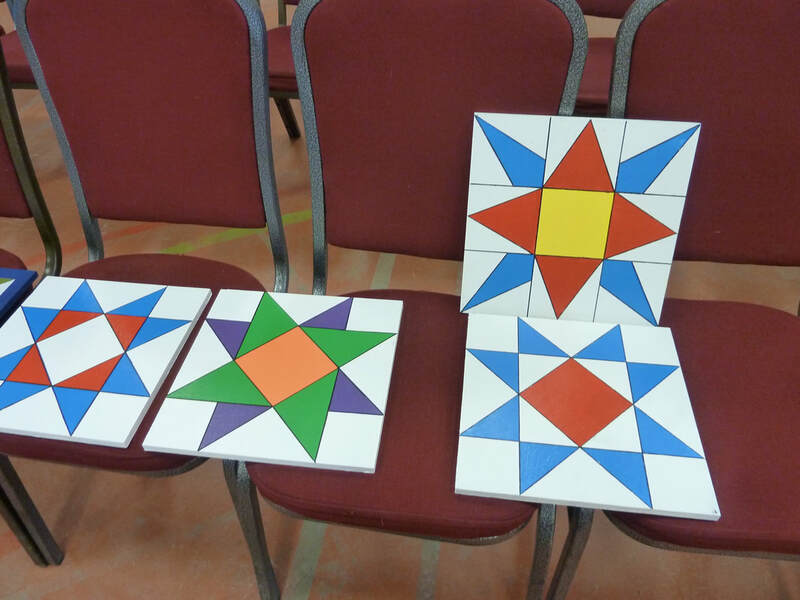 We will be using one of the three techniques we learned at the July meeting (your choice). Lucille will bring the foundation blocks which will be 5 inch square. If you are not part of a mini group, please bring a machine and the list of materials above to make your block. Any member unable to attend the August meeting may make their block at home. Please use one of the July techniques and they must be 5 inches square. Lucille hopes that each member will make one block and she would love to have more than one so that the tree will look very festive. Susan Gates-Harms presents: Stack & Whack; what it is, how it looks, and how it's done.
. . . 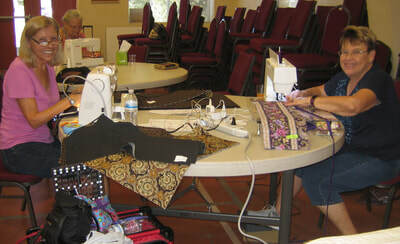 These lovely ladies will have 10 Sewing Circle tables set up with 2 machines, 1 cutter, and 1 presser at each table. 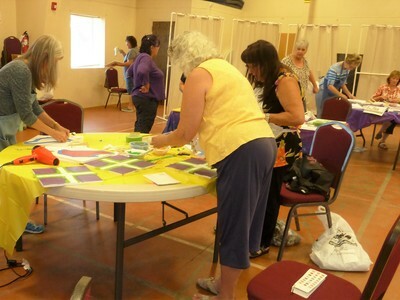 They will begin sewing with the precut 10" squares provided at each table; enough squares to complete a 12-block quilt. Come and participate to see how the "magic" happens! Please Contact Us and let us know what topic you would like to present, or speak with Linda Ruiz, Program Chair, at the programs table at our next meeting. 2nd Tuesday of each month ~ 9:30 a.m.